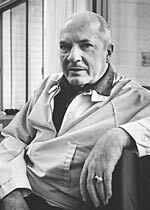 Heinlein was born in Butler, Missouri on July 7, 1907, but spent his childhood in Kansas City, MS. He graduated from the U.S. Naval academy in 1929 and served as an officer in the US Navy until discharged in 1934 due to pulmonary TB. He was married three times. He was active in politics supporting Upton Sinclairs End Poverty movement and his nomination for Governor in 1934 in addition to running for the California State Assembly. In 1939 he published his first story in Astounding Science Fiction magazine. During the War, Heinlein worked at the Philadelphia Naval Shipyard as an aeronautical engineer where he recruited Isaac Asimov and Sprague de Camp. In 1947 he published four influential stories in the Saturday Evening Post. In 1950 he started his Heinlein juveniles for Scribners, which many consider his most influential work in that many children were given an early exposure to SF, scientific and social issues. Starship Troopers was to be the last and most controversial of these juveniles, which Scribners rejected. The ending of his work with Scribners gave him a greater freedom to write what he wanted. His most controversial works such as Stranger in a Strange Land(1961) and The Moon is a Harsh Mistress(1966) were published during this time. In 1970, Heinlein was plagued by a variety of ailments, which prevented sustained writing, but he managed to write Time Enough for Love in 1973. In 1978 he had carotid bypass surgery and from 1980 managed to write five novels before succumbing to emphysema and congestive heart failure on May 8, 1988. Science fiction legend Robert Heinlein is a walking contradiction. His stories address themes of patriotism and duty while at the same time stressing the importance of personal freedom and expression. In Robert Heinlein's 1952 novel The Puppet Masters, the world is taken over by mind-controlling invaders. Is this mere science fiction? Not when an actual cutting-edge magnetic device has been proven to alter the outcome of decisions when trained on the human brain. With 1960's Starship Troopers, Robert Heinlein writes of a military equipped with strength-enhancing power suits. Today, electronic exoskeletons are being developed for the U.S. Army, to create the super soldiers of tomorrow. Heinlein's Stranger in a Strange Land struck a chord with the 1960s counterculture and made the writer a reluctant icon of the free-love movement. Among the future devices predicted by Heinlein is a sci-fi classic: the waterbed. Robert Heinlein's challenging work addresses formerly taboo topics like religion and sexuality and propelled sci-fi towards mainstream literary acceptance. His innovative work continues to draw supporters and detractors, challenging readers with a steadfast theme: what is freedom? To purchase the Science Channel's excellent one-hour documentary on Heinlein, click here.